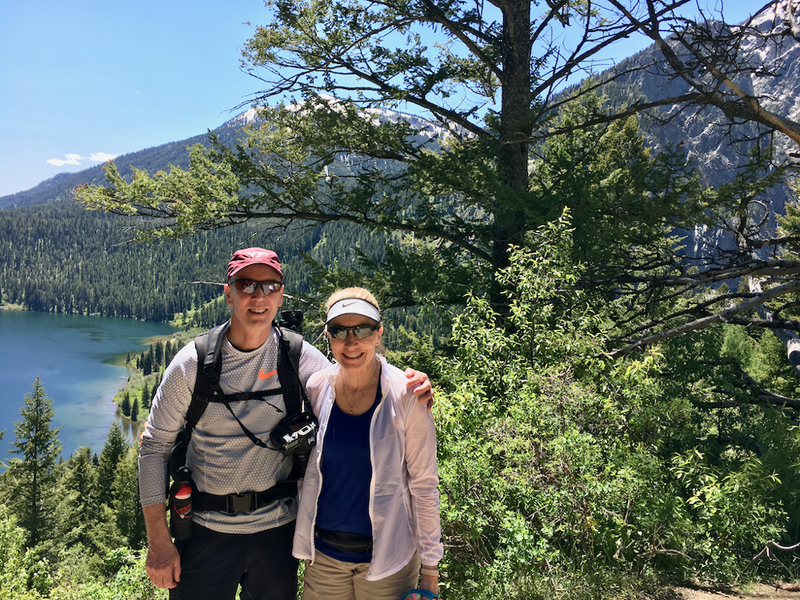 Just a few short hours after completing the Grand Teton Half Marathon my husband convinced me that in order to make the most out of our vacation, a Phelps Lake hike was in order, and there was no time like the present. I, on the other hand, thought a shower and a long afternoon nap would make my vacation perfect! Knowing our time in Jackson, Wyoming was limited, I relented, changed into dry clothes, and made a deal. I’d hike, but only after doing a little yoga to stretch out my tight running muscles and eating a big breakfast. A little research took us to Nora’s Fish Creek Inn for a fabulous breakfast of scrambled eggs, extra crispy bacon, and a hotcake the size of my head. 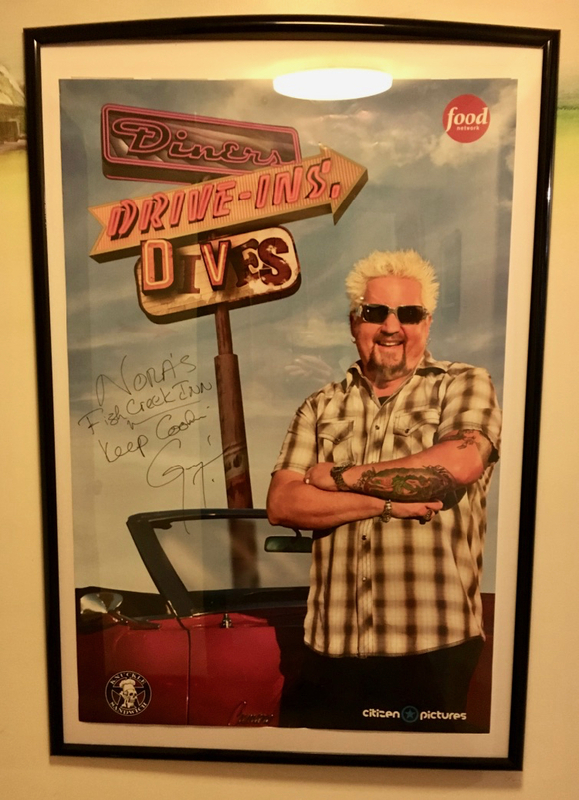 Apparently, we weren’t the only one impressed with this simple down-home style breakfast because it had been featured on Diners Drive-In’s and Dives. With bellies full, we drove north from Wilson to Jackson Hole and Grand Teton National Park. 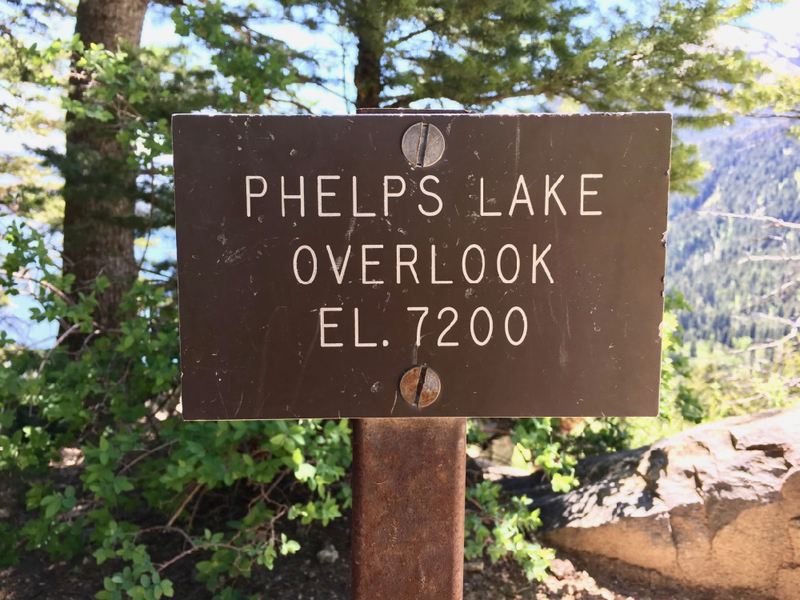 Our first stop would be our Phelps Lake hike before driving around the southern end of the park scouting out other places to explore. With 310,000 acres laying before us, we would only be visiting a smidgen of the park. With limited cellular reception in the park, using Waze was fruitless and we had to resort to old-fashioned map reading. We found the Phelps Lake parking lot, squeezed our rental car into one of the few remaining parking spaces, and started our hike. 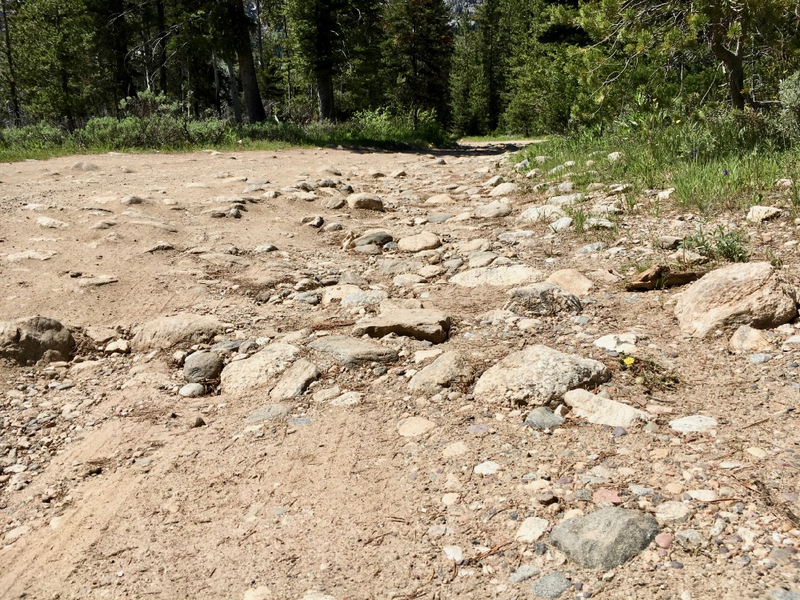 As we walked along the very wide and rocky trail we come upon more and more cars and realized we were still on the road leading to the trail head. After about a half mile hike we finally reached the trail head at 6,807 feet . After running a half marathon earlier in the morning I guess I needed the exercise – HaHa! 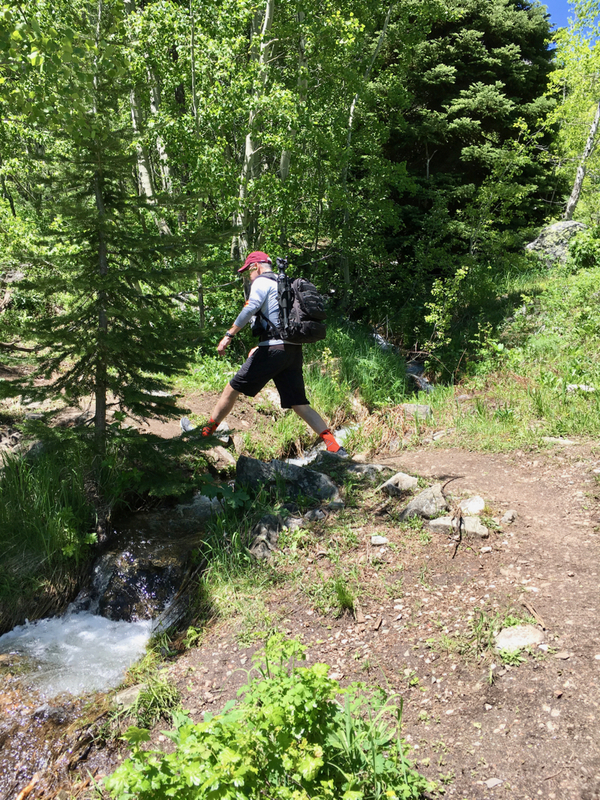 Other than crossing a couple of tiny creeks and climbing a few rather steep sections (400 feet total of altitude gain), the Death Canyon Trail was pretty easy and not that technical. 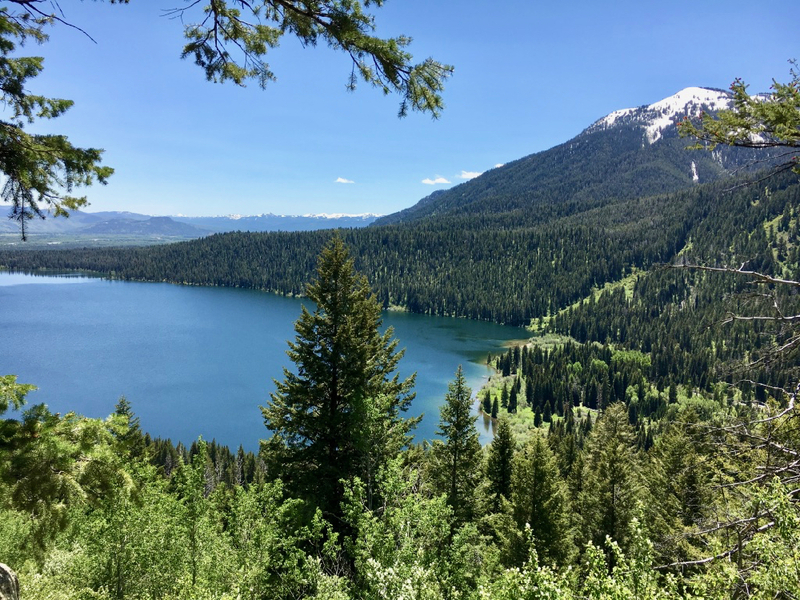 Once we got to Phelps Lake Overlook, we stopped and talked to a mom and her young daughter for a little while, and swapped off taking pictures of each other with Phelps Lake in the background. The view of Mount Hunt as we looked across the glacier lake was stunning. We shifted our position to get both Mount Hunt and Prospectors Mountain in the background. Take a closer look at the red can of bear spay under Bill’s right arm. The inn keeper at Jackson Hole Hideout, the bed and breakfast where we were staying, let us borrow it. 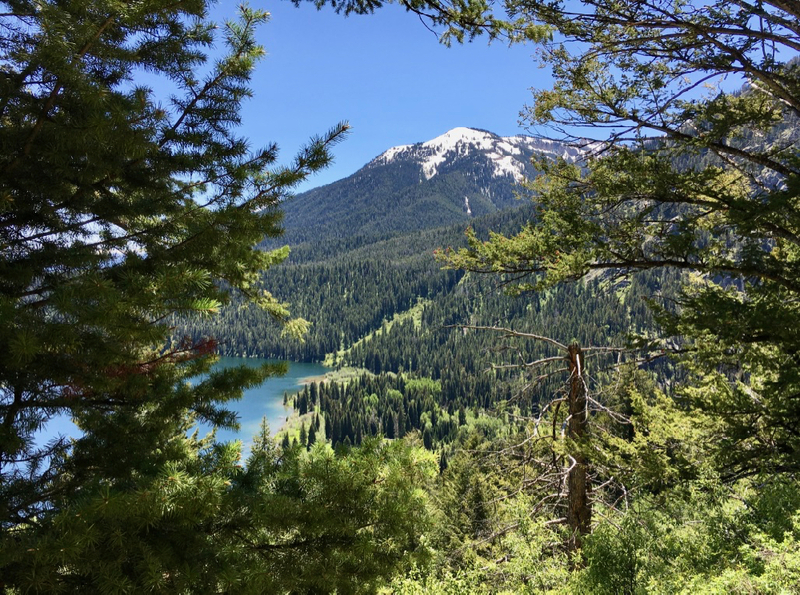 We continued on our hike past Phelps Lake Overlook for a short distance so Bill could capture some pictures from a different angle. On our hike back up toward the overlook we met a man running toward us. I can’t imagine a more beautiful place for a trail run! As we headed back down, we met a group of girls with hula hoops. It was totally random that they were carrying hula hoops and I wanted to challenge one of them to a hula hoop competition. 😉 We noticed that the girls smelled really good which didn’t make sense after hiking up the trail. I wanted to ask what their secret was and if they’d found a new female version of Axe. The descent was much faster than the ascent, and surprisingly, neither of us had any complaints from our knees. I was able to take the lead and saw a little snake scurry off into the brush as I walked by. He was the only wildlife we saw on our hike. Nearing the parking lot we met a guy and his teenage daughter (we assumed) running up the trail toward us. Again, I can’t imagine a more gorgeous place to run! Once back in the parking lot we met a young man named CL who works for the park service. 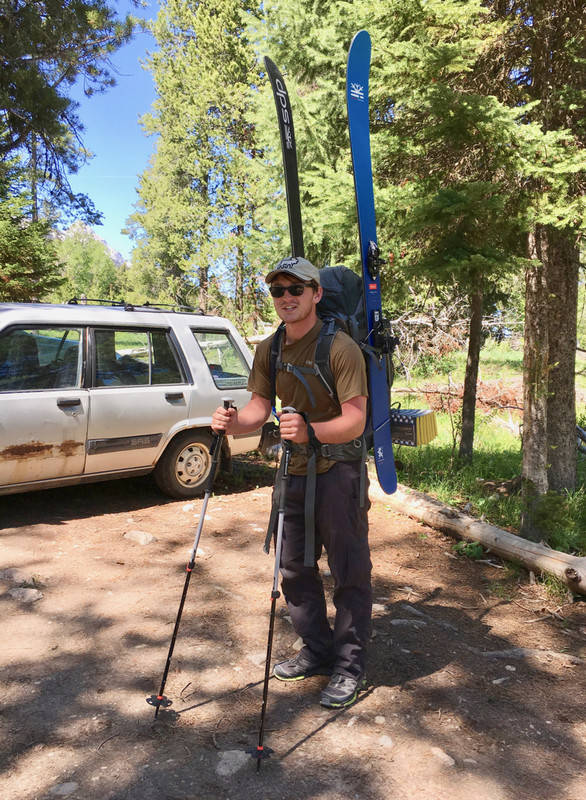 He had a 45-pound backpack slung on his back and was about to start his hike into the backcountry for overnight camping and some skiing the next morning. We wished him well and said a quick little prayer for his safety. What type of footwear do you wear when hiking? 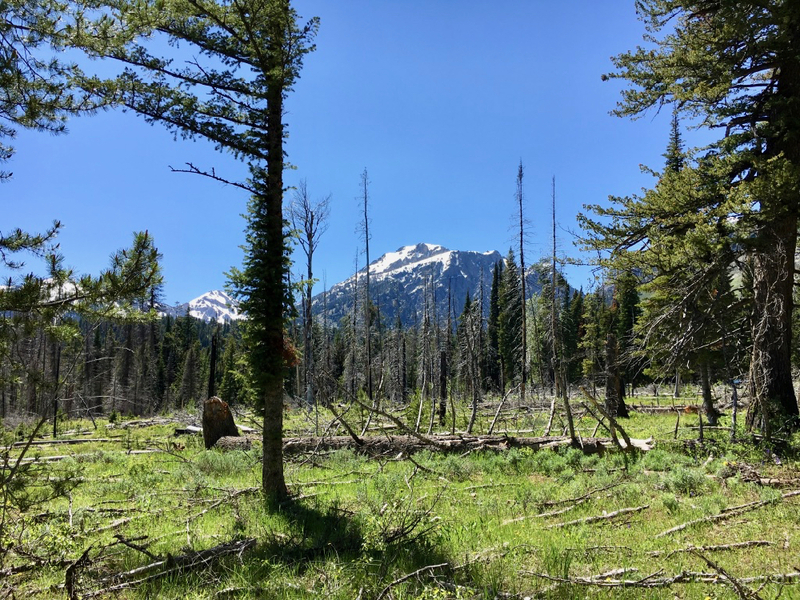 Have you visited Grand Teton National Park? Thanks, Laurie! You know you would have/could have done the same thing! We spent a lot more time driving around the park and taking pictures before finally driving back to Wilson and picking up dinner. It wasn’t until after eating dinner on the deck at our bed and breakfast that I finally took my shower at around 7 PM. I loved this hike when we did it in September 2013. 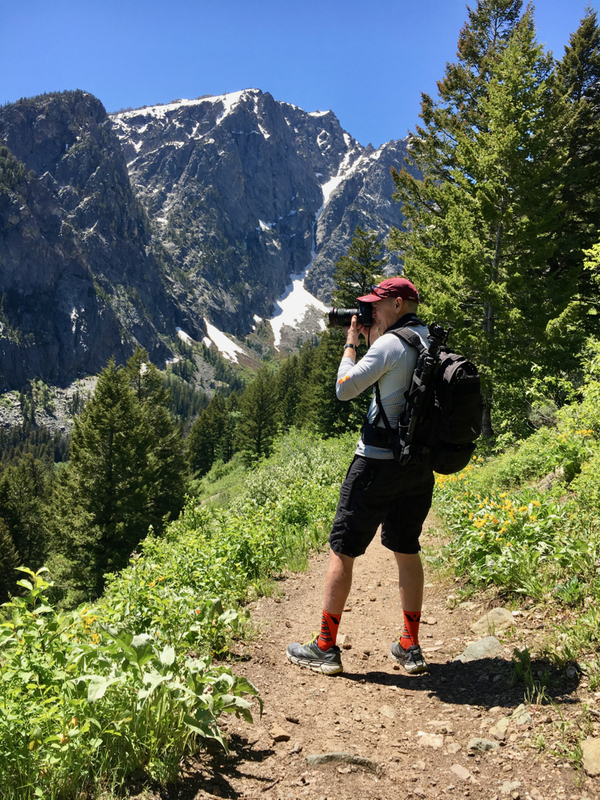 Grand Tetons is one of our favorite national parks. And for the record, I have a knack for dragging my husband out to the trails directly after races near the parks. I figure the pain is always worse the next day, anyway. Congratulations on your race! 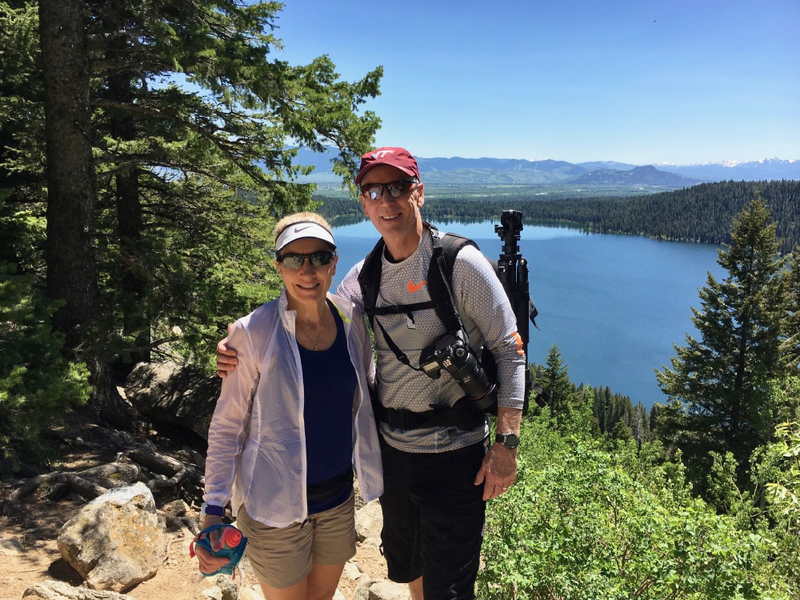 We were in Wilson/Jackson Hole for one day and part of two days so it was difficult for us to do as many things as we wanted to do. We more than made up for it, though, in Southern Utah!